What is Minimally Invasive Foot Surgery (MIFS)? Minimally invasive foot surgery uses the latest advanced technology to treat foot and ankle pain caused by a variety of conditions. Special surgical instruments, devices and advanced imaging techniques are used to visualize and perform the surgery through small incisions. The aim of MIFS is to minimize damage to the muscles and surrounding structures enabling a faster recovery with less pain. 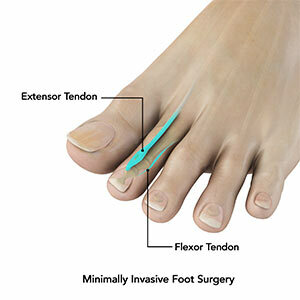 Minimally invasive foot surgery is performed through very small incisions. Through these small incisions, segmental tubular retractors and dilators are inserted to retract muscles away from the operative area and provide access to the affected area of the foot. This minimizes the damage to the muscles and soft tissues and lessens blood loss during the surgery. An endoscope, a thin telescope-like instrument with a video camera on the end is inserted through one of the tiny incisions to provide images of the operation field on the monitor in the operating room. Special tiny surgical instruments are passed through the working channel of the endoscope to perform the surgery. Sometimes, surgical microscopes may also be used to magnify the visual field. Once the surgery is complete, the tissues fall back in place, as the various instruments are removed. The incision is then closed and covered with surgical tape. As with any surgical procedure, there are risks involved with minimally invasive foot surgery. The risks and complications of MIFS may include infection, bleeding, nerve injury, as well as complications due to general anesthesia.